Habit: Plant in soil or rock crevices; rhizome short-creeping, scales variously colored. Leaf: < +- 1 m; stipe cylindric, generally dark red-brown to +- black, shiny, +- scaly at base; blade 2--3-pinnate or +- palmate-pinnate (1st division +- palmate, subsequent ones pinnate), pinnae stalked, fan-shaped or oblong, generally lobed, toothed, or both; axes, blades lacking colored exudate. Sporangia: borne along veins on and covered by highly modified, recurved part of segment margin, appearing to run together at maturity; false indusia +- semicircular to linear; spores generally smooth, tan. Species In Genus: +- 200 species: tropics, temperate. Etymology: (Greek: unwettable) Note: Widely cultivated. Leaf: generally (7)20--40(50+) cm; stipe dark brown to +- black; blade 2--3-pinnate; pinnules cut or lobed often > 1/4 way to base, often with < 4 +- irregular lobes, margins at base converging at 45--90(+)°, stipe color often extending gradually into base, midvein often part way along 1 margin. Sporangia: sori (and false indusia) (2)3--11 per pinnule, generally < 5 mm, without yellowish exudate among sporangia. Chromosomes: 2n=60. Ecology: Uncommon (or locally common). Shaded, rocky or moist banks, exposed sites or not; Elevation: < 2300 m. Bioregional Distribution: NCoR, CaRF, n SNF, s SNH, SnJV, CCo, SCoRO, SW, GB, D; Distribution Outside California: generally southern United States; worldwide, especially temperate. Note: Widely cultivated. Citation for this treatment: Layne Huiet, Ruth E.B. 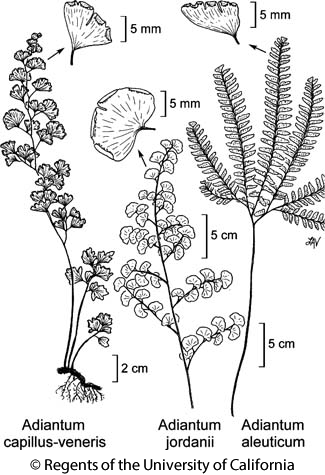 Kirkpatrick, Alan R. Smith & Thomas Lemieux 2016, Adiantum capillus-veneris, in Jepson Flora Project (eds.) Jepson eFlora, Revision 4, http://ucjeps.berkeley.edu/eflora/eflora_display.php?tid=11947, accessed on April 24, 2019. NCoR, CaRF, n SNF, s SNH, SnJV, CCo, SCoRO, SW, GB, D; Markers link to CCH specimen records. Yellow markers indicate records that may provide evidence for eFlora range revision or may have georeferencing or identification issues. Purple markers indicate specimens collected from a garden, greenhouse, or other non-wild location.